Township municipal offices are located at 680 Moselem Springs Road, Shoemakersville PA 19555; phone: 610-562-2133. 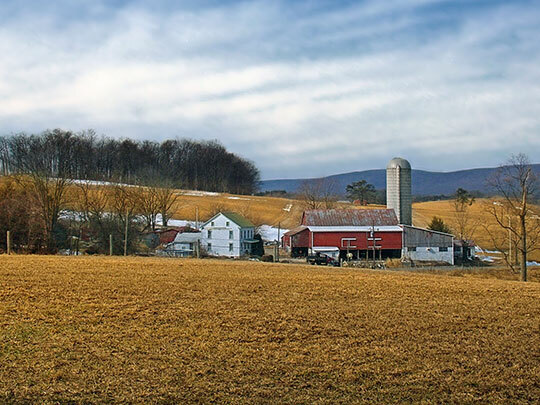 Photo: Hartsprings Farm, Windsor Castle Road, Perry Township (Berks County), PA. Photographed by User:Dincher (own work), 2011, [cc-by-2.0 (creativecommons.org/licenses/by/2.0)], via Wikimedia Commons, accessed July, 2014. Some men who lived in Windsor Township served in the war of 1812. When this township was organized they had influence enough to have the name of the hero of Lake Erie selected as the name of the township. So it is called Perry. Captain John May and thirty-five men of his company came from this township. An act passed in 1821 provided that the township of Perry should be a separate election district, and it was not until 1852 that the township was actually established. The first log building of Zion's Church was built in 1761. The industries are chiefly farming. Near Virginville is a stone quarry from which flagstones of fine quality and large size are taken. On Plum Creek, about a mile east of Shoemakersville, is a mill site on which a mill has been operated for many years. A new building has been erected which is equipped with modern machinery. Upon its banks is also a tannery, a part of which building was erected in 1810. Near Shoemakersville is also a pottery. The Shoemakersville Clay Works for the manufacture of glazed sewer pipes was established in 1897. The Shoemakersville Mill was built about 1840. It is operated by Plum Creek and the Schuylkill. It is supplied with modern machinery. The Clay Works were purchased in 1908 by the Glen-Gery Brick and Cement Company for the manufacture of vitrified brick for building and paving purposes. The Inlaid Tile Company was organized in Reading, but in 1908 was transferred to Shoemakersville. Its machinery was imported, and it is the only plant of its kind in the United States.